Paris, April 1999: Aimée Leduc has her work cut out for her—running her detective agency and fighting off sleep deprivation as she tries to be a good single mother to her new bébé. The last thing she has time for now is to take on a personal investigation for a poor manouche (Gypsy) boy. But he insists his dying mother has an important secret she needs to tell Aimée, something to do with Aimée’s father’s unsolved murder a decade ago. How can she say no? The dying woman’s secret is even more dangerous than her son realized. When Aimée arrives at the hospital, the boy’s mother has disappeared. She was far too sick to leave on her own—she must have been abducted. What does she know that’s so important it’s worth killing for? And will Aimée be able to find her before it’s too late and the medication keeping her alive runs out? "Aimée is a tall, spiky-haired P.I. who favors high heels, knock-off couture and Chanel No. 5. This time out, Aimée is juggling new motherhood with running her detective agency, when she gets word that a dying woman has a secret to share." "Don’t be daunted by the depth you find here. These books will go every bit as quickly as your vacation in Paris, if they do not in fact become your vacation in Paris." "Newcomers will be swept up in Black’s narrative as she follows Aimée through the streets and alleys of one of the world’s most exotic cities and cultures." "In many ways, Aimée Leduc has changed from when we first met her. For one thing, Leduc is now a mother, in this, her fifteenth outing. But some things remain the same: Leduc is still passionate about her work in the detective agency she runs, and she still remains fashionably dressed, whether in a slinky black Versace dress or a vintage Courrèges (although perhaps with a little more baby spit-up)." "No non-French crime writer can take you through Paris like Cara Black." "Aimée's 15th outing is a killer, with all the suspense, all the surprise and all the Parisian flavor you'd expect from Black." 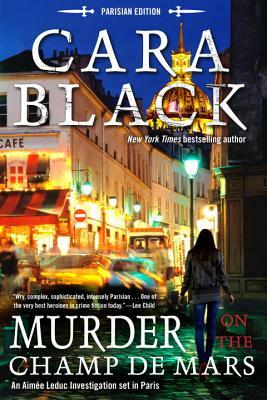 "Black once again delivers what her readers crave: high-speed Parisian peregrinations, chic suspense, a touch of humor, and the indomitable Aimée, as unstoppable with a baby strapped to her hip as she was with one growing in her belly." "Sassy, openhearted Aimée Leduc is back for a 15th outing that takes readers to Paris’s elegant, old-gold seventh arrondissement. It’s not all luxe, though; even as ­Aimée balances work-life responsibilities as a new mom with a detective agency to run, she helps a poor Gypsy boy whose dangerously ill mother has a secret to share." "Black does a masterful job of keeping the threads of suspense pulled taut, and braiding this complex investigation that puts Aimée Leduc and her family, friends, and career at risk in two directions at once." "Black’s books are superb examples of the genre, not only (albeit largely) because of Aimée, but because they also invoke Paris—past and present—vividly."